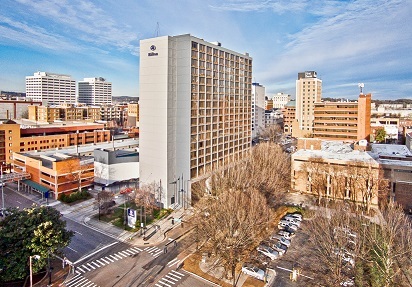 Hilton Knoxville is located in the heart of downtown Knoxville and within walking distance of Market Square, Gay Street and the University of Tennessee. Knoxville is exactly what people declare it to be: a hidden gem. The city offers a surprisingly real, truly accessible and unexpectedly sophisticated mix of culture, adventure and cuisine rooted in history and genuine Southern hospitality. Exploring the downtown area is easy because of its walkability. Discover vibrant murals, local music, historic sites, art museums, parks and greenways. It is a destination that will deliver several, "Wow, I had no idea!" experiences. McGhee Tyson Airport (TYS) is the closest airport to the Hilton Knoxville with the most airline options to fly in and out of the area. The distance from the airport to the hotel is 13 miles, or a 20-minute ride.The taxi fare will be around $25. One-way fare between McGhee Tyson Airport and the Hilton Knoxville is about $25.